That is quite clear, red splatter on the red carpet at the Oscars 2015. Visible Saint Laurent gown Dakota Johnson, Givenchy couture worn Rosamund Pike, and the model Behati Prinsloo. For Behati, Armani gown choices actually have a black base color - the details that make it look like a sprinkling of 'red.' Then there Solange who wore a dress from Christian Siriano. Black dresses may be the safest option on the red carpet. Some of the celebrities who wear this color on the red carpet, including last year's Oscar winner Cate Blanchett wearing Margiela, Sienna Miller, a young actress on the rise Margot Robbie, or 3 times Oscar winner Meryl Streep who wore a blazer over a white dress, and long black skirt. 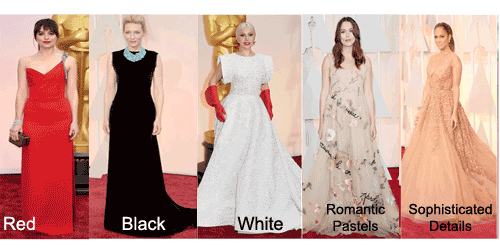 White color chosen by celebrities like Julianne Moore (in Chanel), Lady Gaga in Azzedine Alaia dress, Oscar winner Marion Cotillard in Dior Couture gown, Lupita Nyong'o wearing Calvin Klein. Other actresses who are also wearing this color is the wife of a handsome actor Channing Tatum, Jenna Dewan Tatum (she Wore Zuhair Murad). While the singer Faith Hill chose J. Mendel dress with white details also, quite elegant. This soft tone chosen by some celebrities such as Keira Knightley (she Wore Valentino), Gwyneth Paltrow chose a dress with shoulder detail dusty pink colored giant, Kerry Washington who choose Miu Miu, while Zoe Saldana chose Atelier Versace dress also with the same tone. Actress Anna Kendrick is somewhat different. Pastel tone at Thakoon dress she wore little more deep (not pale like other actresses in this group). Intricate embroidery embellishment sophisticated until we found in dresses celebrities selection below. Emma Stone wowed in a lime green dress Elie Saab are very sophisticated, but also glamorous. Lupita Nyong'o wearing a dress with jewel detail thousands of Calvin Klein. Red Givenchy dress selected Rosamund Pike hide intricate embroidery detail - but also romantic. Oscar winner Marion Cotillard chose Dior Couture gown with a very unique perforated technique. There is also Jennifer Lopez who choose dresses with color slightly darker than the color of his skin (Elie Saab creation) with a very low cleavage.